Sally's Cardio-Kickboxing class is unlike any group fitness class you have ever taken. While the class is accessible to all fitness levels, it will push you to new limits each and every time. Curious? Come in and try it out! All equipment is on site. VO2 Fitness is owned and operated by the Studer Family: Sally, Ava, Kyra and Joe. Our instructors' passion is to help you be a better version of yourself - stronger, fitter, and more determined. Once you try our classes, you will understand why our clients stay with us. Cardio-Kickboxing is especially popular at VO2 Fitness - check out this group of ladies before a hard hitting hour with Sally! Many of the women pictured here have been training alongside Sally for a long time - her intense and motivating classes keep people coming back class after class! A huge congratulations to Jon Borrows and Dave George for both winning double gold at the January 2015 New Breed Ultimate Challenge Jiu-Jitsu Tournament in Charlotte, NC. VO2 Fitness BJJ Instructor Jon and VO2 student Dave both won gold in their gi and no-gi divisions; Jon also won a silver in a higher weight class no-gi division. So proud of our VO2 Fitness Jiu-Jitsu grapplers! VO2 Fitness is proud to host specialty classes like FLEX, led by certified group fitness instructor Michelle Newman Brady. Especially created for VO2 Fitness, FLEX runs from 8:30-9:30am on Saturday mornings. This is a picture of some seriously dedicated women. They work extremely hard for one hour to make themselves healthy, fit, and happy. It's a tough workout, but it's all smiles at the end! The closing series of each Cardio-Kickboxing class is an intense core workout. The VO2 Fitness Facility features 14 heavy bags for use in Cardio-Kickboxing and Boxfit classes. Our personal trainers also utilize the bags for sport specific training and conditioning. No other facility in Licking County can boast of the same setup! VO2 Fitness has two sets of heavy duty battle ropes. Ropes are used in personal training, circuit classes, and they are a must when you are ready to go into BEAST MODE! 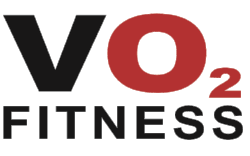 In addition to our open layout for group fitness classes, VO2 Fitness has a full weight room on site. This part of the facility is primarily used by our personal trainers to get you into the best shape of your life! The weight room features several machines and free weights.